To everyone in the free world, she was simply called Tallulah. The voice was unmistakable, steeped in bourbon with notes of cello and a smoky, gravel finish; the laugh, a rollicking contagion of cannonball fire. Her remarkable beauty, framed by a cascading golden mane was captured by glittering notables from yesteryear such as Cecil Beaton and George Hurrell. And once upon a time, when Tallulah moved to Pound Ridge, the celebrity-filled, booze-fueled parties rarely stopped. Tallulah who? Bankhead, naturally. Long before Cher and Madonna, Tallulah made a singular name for herself, known as a great actress and the grandest of dames whose freewheeling antics offstage (with the occasional inspired cartwheel onstage) sometimes muddied the striking depths of her performances. Hailing from a prominent political family in Alabama, she first found international fame across the pond. The furor she created in ’20s London was only rivaled years later by Sinatra, stateside. The gallery girls, an unusually devoted stream of clamoring adolescent fans poured in and out of West End theaters to see their Tallulah. She tangled with Hollywood and the formidable MGM head Louis B. Mayer, but her role in Alfred Hitchcock’sLifeboat proved to be her best film performance and well-timed too: she used the money to continue work on her Tudor-style country house, namely a major dig for well water roughly 300 yards from the house and down a number of fathoms. 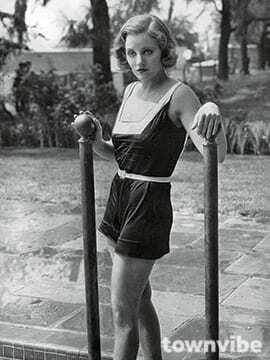 Of course, Ms. Bankhead required a pool, the hangover-inducing installation of which cost over $100,000—at the time the whole 18-acres had sold for $25,000. Bankhead moved into Pound Ridge in the early ’40s on the heels of her greatest Broadway triumph in The Little Foxes. The further success of The Skin of Our Teeth secured the purchase. She had only ever staked out hotel suites or rentals such as her London townhouse, The Garden of Allah in Hollywood, or the early years at the Algonquin in New York, pitting wits with the storied Round Table. She had the freedom now to parade her black panther down the sweeping private driveway to check the day’s mail, but it remained imperative to Bankhead that all visitors be announced—she planted signs along the driveway that currently convey the same message, “Blow Your Horn.” After all, she needed fair warning to either put some clothes on or take them off, depending. Windows, Bankhead’s Tudor-style home today. The chestnut tree she planted that was purported to sport pink flowers and bloomed white instead still stands, and the long term current owners maintain the lilies of the valley as well, which Bankhead planted in tribute to her birth flower. She laments in Tallulah that the climate was too hostile to raise a Southern magnolia, however. The owners’ changes to the house concerned only converting the three-car garage to a warmly wooded den, painting, and decorating. They also dispensed with what had been essentially a large barroom upstairs in favor of two capacious guest bedrooms. In the early ’50s, Bankhead continued the commute, huskily breathing new life into radio with “The Big Show.” Fuzzy home movies on YouTube from that era reveal a different, private side of the actress, beaming over her godchild Brook Ashley and frolicking with her moppy dogs in the backyard—but Ashley remembers the excitement too. “Even a fire simply moved the celebration onto the lawn,” she says. Incidentally, an agreeable spot on the lawn was found years later, so a Southern magnolia tree could finally raise its pale, waxy blossoms. Tallulah Bankhead was every inch a star and above all else, a lady. She may have left Pound Ridge just over 60 years ago, but a pair of soaring red-tailed hawks currently supervise the peaceful grounds and gusts of wind extend their welcome. It’s almost possible to picture the famous shadows shimmering across the greensward, like ghost moths bewitched by a cocktail moon, dissolving into celluloid honey—with Bankhead among them, turning cartwheels.